It wasn’t Cornhill Street, Cornhill Road, Cornhill Avenue, or even the Cornhill; instead, it was just Cornhill, and in its day, knowing this was just one more way that those in the know had to distinguish locals from those visiting Boston as tourists. In its history, Boston has had two roads called Cornhill. The first, named after its namesake in London, ran from Water Street to Dock Square, was laid out in 1708 as part of a winding road between Roxbury and Boston. Some 80 years later, in 1789, George Washington drove over ‘Old Cornhill’ during his ceremonial visit to Boston as the country’s first president. As part of the occasion and as part of a larger movement to rename Boston streets after the Revolution, this first Cornhill was renamed Washington Street. Around the same time, State Street emerged from King Street, and Court Street replaced Queen Street. Pudding Lane became Devonshire. A generation later, in 1816, Uriah Cotting planned ‘New Cornhill’. 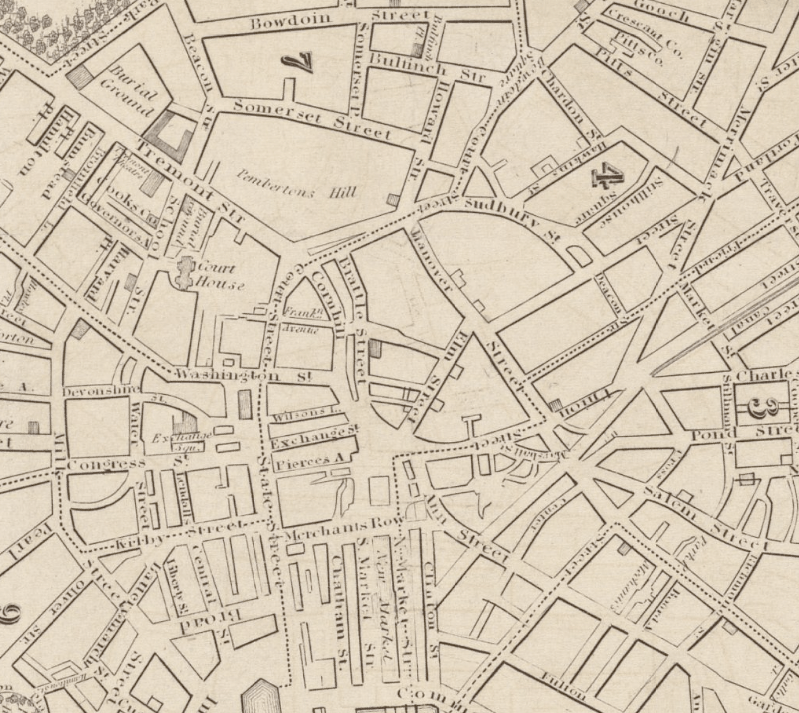 From Court Street to its terminus with Washington Street at Adams Square, the curving road was initially called ‘Cheapside’, later ‘Market Street’, and ultimately ‘Cornhill’ in 1829, thus resurrecting the street onto Boston maps. This 1832 map of Boston shows the area that would one day become Government Center. At the time, Cornhill spanned from Court Street to Washington Street. Cornhill quickly attracted Boston’s best booksellers and publishers. With them came the best-known religious, social, and political thinkers of the day. Cornhill soon became a mecca for Boston’s intellectuals during its mid-19th-century heyday. 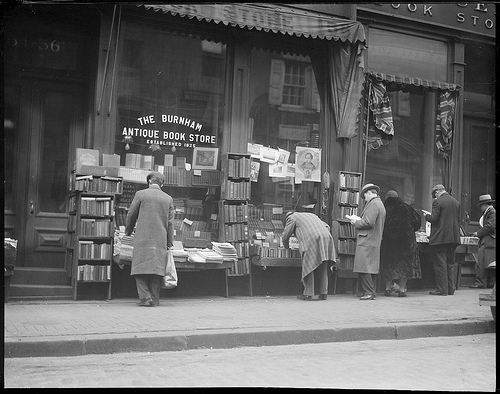 Writers like Ralph Waldo Emerson, James Russell Lowell, and John Greenleaf Whittier met at Burnham’s book store (later the Brattle Book Shop) on Cornhill, in the Sears Crescent Building. Oliver Wendell Holmes kept law offices there. And William Lloyd Garrison published The Liberator there, as well. Angry mobs were twice seen dragging him from his office, subsequently tarring and feathering him. Yet another Cornhill thinker, Horace Mann, became famous for his contributions to American education reform, creating the model eventually adopted by many states for their public school system. Even the creator of the Graham Cracker, Dr. Sylvester Graham, claimed an office on Cornhill. J. J. Jewett, also a Cornhill merchant and a supporter of the Underground Railroad, published the first American version of Uncle Tom’s Cabin from Cornhill, selling 3,000 copies on his first day, and 300,000 during his first year. During the Civil War, many runaway slaves were hidden in the basement under William Lloyd Garrison’s Cornhill office, a vital link in the underground railroad. Julia Ward Howe wrote “The Battle Hymn of the Republic” there. 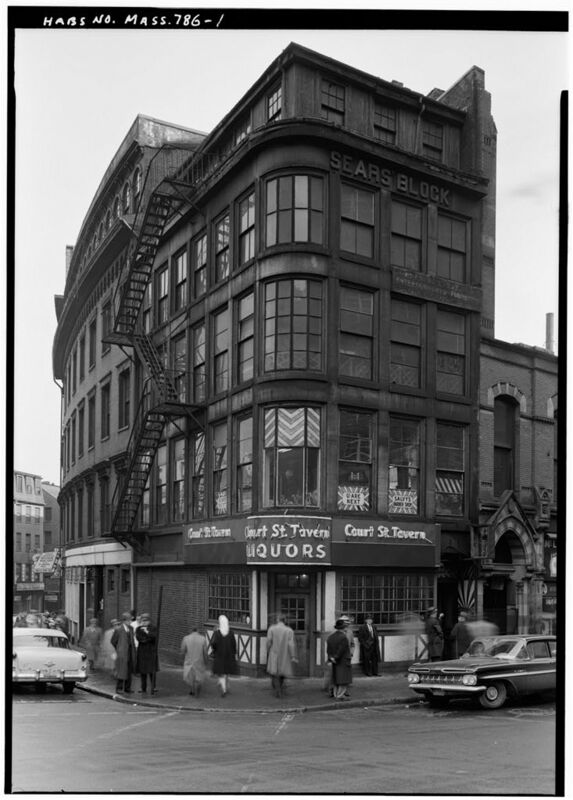 Sears’ Block, 72 Cornhill Street, Boston, Suffolk County, MA – (Via Library of Congress – Created by Crevin Robinson, 1962). Court Street Tavern is now the site of Starbucks, which today boasts above its entrance a 227-gallon golden kettle, rescued from nearby Scollay Square during its razing. So the legacy of Cornhill continued through the middle of the 19th century. As the 19th century came to a close, even Cornhill began to lose some of its luster as the preeminent location for publishers and booksellers, the street was still dominated by the city’s booksellers. Scholars, casual browsers and even future personalities like Theodore Roosevelt, FDR and JFK all frequented the area as students. The intellectual energy so synonymous with Cornhill may have subsided in the wake of the Civil War, but the days of the area’s booksellers continued until the coming of Government Center. Intersection of Court Street, Cambridge Street and Tremont Street, at Government Center, today (via Wikipedia, contributed by M2545). The Sears Block (tan) and the Sears Crescent (red brick) still stand at the intersection, the sole survivors of the location’s pre-Government Center history. Today, the only surviving remnants of Cornhill are the Sears Block and Sears Crescent. David Sears built the Sears Crescent in 1816, after being inspired by Charles Bullfinch‘s Tontine Crescent. The building follows the gentle curve of Cornhill’s original layout. The Sears Block, right next door and built in 1848, followed, and today houses a Starbucks known for its golden steaming kettle, cast in 1873 for the Oriental Tea Company. 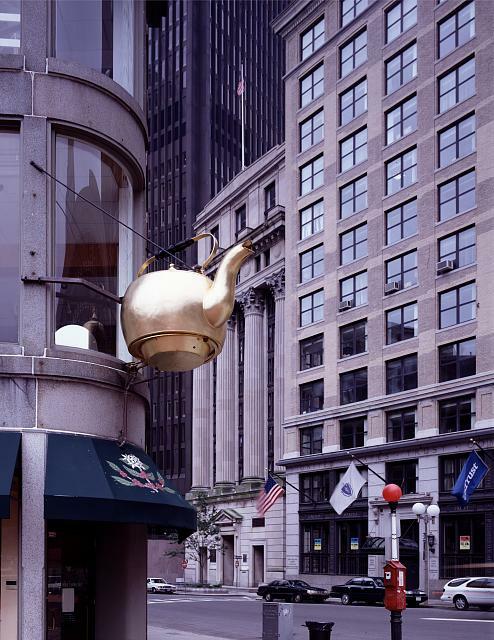 The kettle, which originally hung in nearby Scollay Square (like Cornhill, also destroyed during the construction of the Government Center), became famous when the Oriental Tea Company ran a contest in 1874, encouraging those so-inspired to guess the kettle’s capacity. Eight winners stepped forward to claim chests of premium tea when they correctly guessed that the kettle held 227 gallons, two quarts, one pint, and three gills. The kettle was rescued from Scollay Square during its razing, and moved to the front of the Sears Block in 1967, where it remains today. 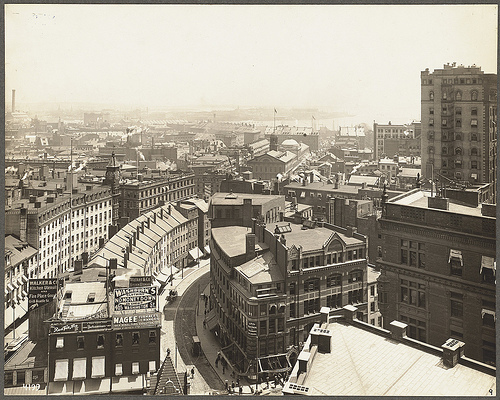 Cornhill, along with Scollay Square, was destroyed during the construction of Boston’s Government Center during the city’s 1960s-era Urban Renewal Scheme. Initially, Government Center was lauded as “a model of how urban renewal, when imaginatively conceived and carried out, can bring new vitality and beauty to a city”. Government Center even captured a special commendation from the American Institute of Architects in 1972. Today, the aesthetic merit of the area is assigned, at best, mixed values. Many view the area as a brutalist ‘brick desert’ in the heart of what was once one of Boston’s most picturesque Victorian neighborhoods. Marvelous post and wonderful photos. Boston By Foot’s “Heart of the Freedom Trail” tour ends at Government Center near the teapot, which many guides use to contrast old and new. Thank you for the excellent history lesson! The map of Boston reminds me of the map of Granada, Spain (or Rome, or Florence or Madrid) with everything seeming to emanate out from the city’s center. Seems both literal and figurative. Do you know whatever happened to the Cornhill company? It was a book publisher and I’m a historian who is looking for their archives from the years 1919-1921. Any suggestions you can offer would be greatly appreciated. Thanks so much for this post! Do you happen to know what happened to the Cornhill company? It was a book publisher. I’m a historian who is looking for a manuscript that was sent to them by Lucian Watkins, around 1920. Please contact me if you have any suggestions for how I might go about finding the Cornhill company’s archives, if they still exist anywhere. Thanks again. Pingback: Book Publication – "The hapless orphan or; Innocent victim of revenge"